New year, new you – that’s what they say, right? Sounds overwhelming. And what’s so wrong with the “me” that I am right now? I think the problem with most resolutions is that they’re focused on the finished line rather than the process. I’m talking about the “I’m going to lose 25 pounds” kind of promises that we make (and sometimes break) or the picture we paint of the new, perfect me. As if this non-existent future self is somehow superior to the person I am today, the person I’ve worked on my entire life. That’s why – instead of making false promises of going to the gym every day or pulling a scale goal out of thin air – I’m focused on the in-between. The baby steps. The small changes. The fine-tune adjustments I know make me a better version of myself, make me perform better, think bigger, work harder, show up as a good friend, loving daughter, kind stranger, and fun, adventurous dog-mom. It's not about how I look. It’s about how I feel. So when I start thinking about goal-setting for the coming year, I make a list of the things that make me shine. To help guide and stay on track, I’m working on a weekly checklist with measurable actions to improve the way I show up and move through the world. For me, this includes the bare essentials (it doesn’t have to be complicated) like drinking enough water, reaching a certain amount of steps in a week, eating healthy foods, spending more time in the kitchen (cooking is a relaxing cureall for me), getting enough sleep, reading more, walking along the ocean or breathing in fresh mountain air (this is where I feel most alive), minimizing screentime, and letting my mind dream freely and open up to new ideas or callings. But it’s different for everyone, and what self-care looks like for me might look different for you. Luckily, there are a ton of tools out there to help organize your goals and motivators. 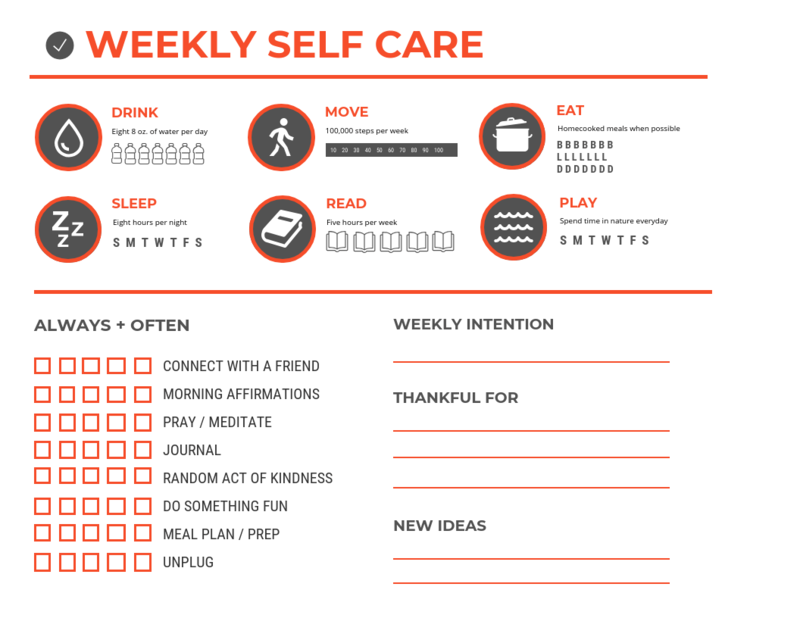 It can be as simple as daily journaling or bullet lists (hello, Bullet Journal), or you can go as far as designing your very own self-care sheet to print out weekly (I’m working on creating one for myself right now – here’s a sneak peek). If you’re not the artsy type (or it just sounds like too much work), there is a ton of great inspiration out there. Model Meal’s Founder Danika Brysha is a big proponent of the self-care checklist, and if you follow her on Instagram you’ll see the ins and outs of how she makes self-care a priority (and if you sign up for her emails you’ll get a free download for a self-care checklist starter kit). So how do you get started? Just start. It’s that simple – grab a pen and paper and start making a list. If you prefer a guided journal, Commit30 makes planners, journals and tools to help you live your best life. And because the universe really does have our back, they offer free downloads, too. Pinterest and Instagram are also a wealth of inspiration (search self-care checklist on Pinterest and #selfcarechecklist on Instagram). Like I told a friend of mine who was feeling stuck, the more you do, the more you do. So let’s get to it and go get em – 2019 is waiting.